Protect your wine or lemonade with a drink cover that blocks bugs and other unwanted drop-ins from ruining the next sip. 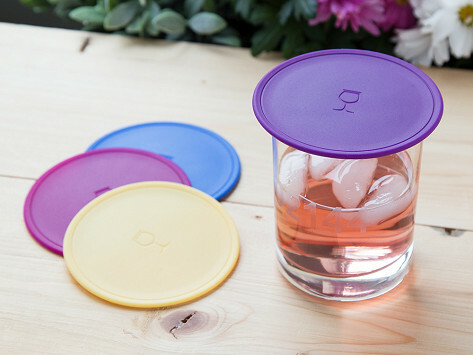 These silicone lids also help to keep your drink contained when you're moving around. A cover can double as a coaster, too. This product is exactly as advertised. Love the colors. Great glass tops for out doors. Drink Tops™ Founder Linda Wachter created this drink cover after one fruit fly too many ruined her beverage. Napkins didn’t do a good job protecting her drink, and when she learned that these pests release an enzyme that changes the flavor of wine, Linda came up with a better, BPA-free silicone solution. Drink Tops™ fit onto most glasses, keeping unwanted add-ins out and helping keep your wine and other beverages in when you’re moving around. There’s a top with stainless steel mesh ventilation panel, too, that lets wine breathe while it’s guarded. And Drink Tops™ pull double duty as coasters—triple duty, if you use a colorful cover as a glass marker. Whether you’re enjoying cocktails on the patio, or are at a cookout or on a camping trip, Linda’s smart idea makes wine time worry-free, wherever you are.